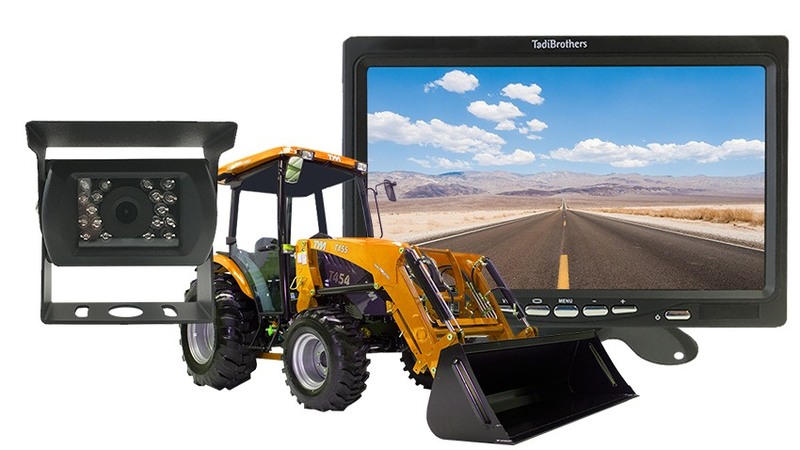 The Tractor backup camera Has a 120° Degree viewable angle, its waterproof and has auto night vision. The camera is one of the most durable we have, with incredible adjustability and night vision clarity. The Tractor camera has a metal sun shield visor to protect you from glare and pebbles. This is by far our toughest built camera. It has been regularly used in Tractors, Cement Mixer, Cranes, buses, Cotton Pickers and industrial sized caterpillar trucks, operated in the harsh oil sand of Canada. This camera can take a direct hit from a rock and it will still work like new. Its has also been very popular with Tractors. This rear view camera can be made wireless as well so there will be no need to run a cable. You can also have it battery operated so there are no cables at all. Finally, you can make it a two camera system if you need even more coverage. This item includes a 15 Foot cable, if its going on a Bulldozer, skid steer, Crane or any other vehicle longer than average SUV we recommend upgrading to our premium extension cables located on the top left of the page.